Queenkv's Eurotrip Photoblog: Kris Vera-Phillips is in Barcelona. She's exploring the sights and flavors of Spain. 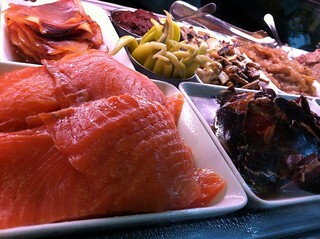 BARCELONA – We found my favorite tapas spot in the city thanks to Anthony Bourdain. Today, we went back to Quimet & Quimet for lunch and souvenirs. 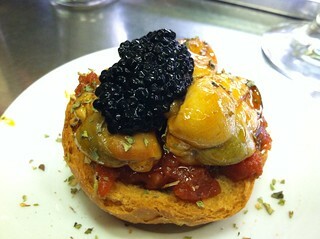 I loved these mejillones topped with caviar, over crunchy toast and tomato paste. I know I will have cravings for the seafood tapas at this tiny, standing-room only food spot near the Espanya metro stop. We got lucky with today’s lunch crowd. Only a hand full of people at the bar, sipping cerveza and nibbling on gourmet small bites. 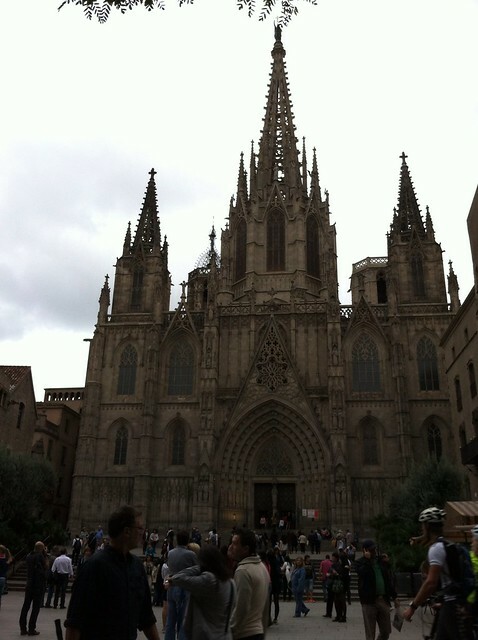 BARCELONA – Time for the mad dash for souvenirs and packing. 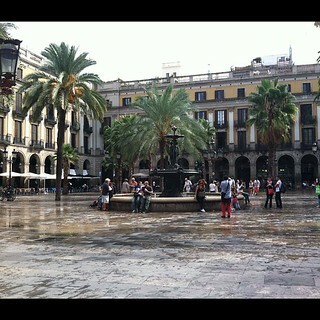 We have less than 24 hours in this delightful city in Catalonia. Overnight rain washed away the sticky humidity lingering in the air. The view from up here is stunning. 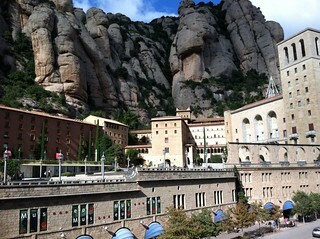 We took a cable car up to the main level, home to the Basilica and museum. 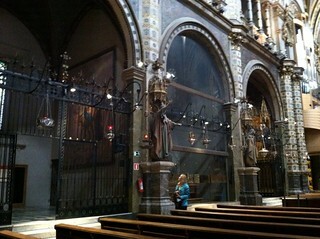 I listened to an organ player rehearsing inside the Basilica as tourists snapped away at the religious icons. 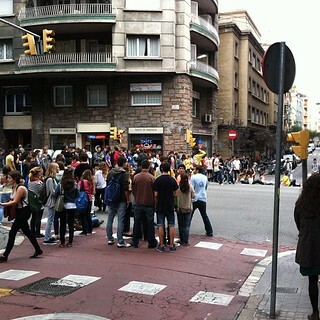 BARCELONA – We ran into our first student protest in Spain today. Many of the kids wore yellow shirts. Most of them looked like they were younger than 16. They blocked off a busy intersection near the Padua metro stop. I think they were demanding an end to education cuts. According to the Business Recorder, thousands of students in Spain are on a 3-day strike. 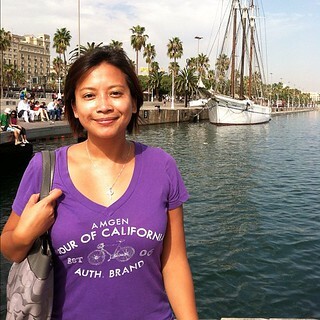 BARCELONA – I covered up my shoulders when we visited the city’s cathedral. Then my cell phone started ringing. 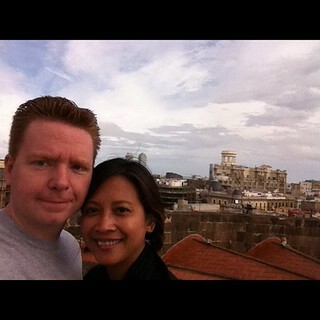 The view on top of St. Església Cathedral Basilica is amazing! I also loved the violin music outside of the church. 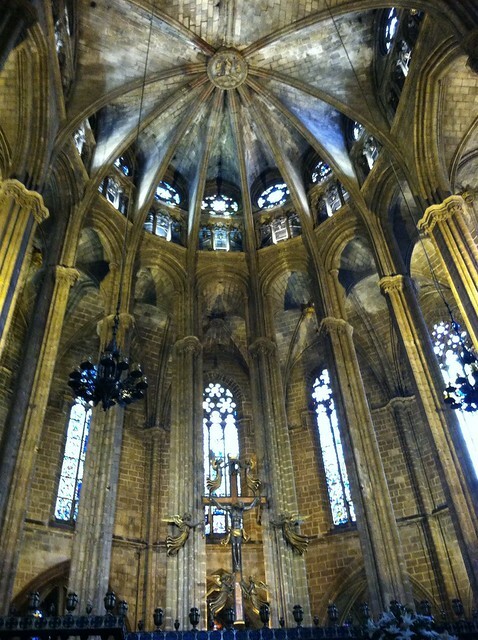 BARCELONA – Church bells chimed, ending my siesta. Our neighborhood cathedral marked the end of the work day with a sweet concert of recorded bells. It reminded me of the carillon bells ringing inside the Campanile as I walked between lecture halls at Cal. I just spotted a black and white dog barking. He clearly didn’t want to be left out on his balcony perch for the next round of showers and thunderstorms. 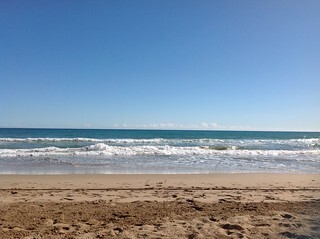 Yesterday, rain washed away the heat. My clothes stopped sticking to my skin in the humidity. I wrapped a scarf around my neck when I felt a cool breeze. It finally feels like autumn in Barcelona. 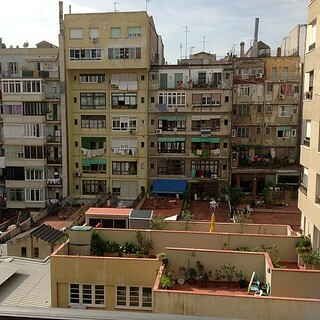 BARCELONA – Here’s the view from our apartment. Sometimes, I feel like Jimmy Stewart in Hitchcock’s “Rear Window.” The other night, I had a glass of wine on the balcony. I listened to forks and knives clatter on plates, kids screaming at each other and couples catching up. I spotted this charming scene near Barri Gothic. I was tickled to see the boy spinning around to the tunes of Oasis. He looked so happy. BARCELONA – Our neighborhood, L’Eixample, is home to a number of Spanish/Catalan icons. It’s easy to instruct taxis to our homes once we mention this thing. 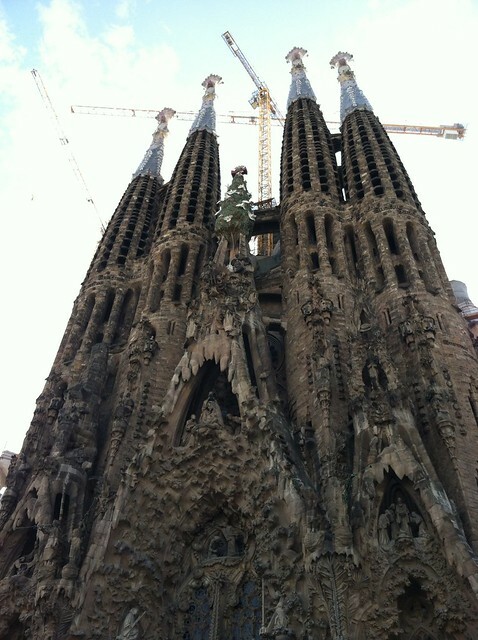 Our apartment/hotel is about a block away from La Sagrada Familia. According to Lonely Planet, Antoni Gaudi’s cathedral has been under construction for the last century. We also stumbled on another Spanish tradition, La Monumental. 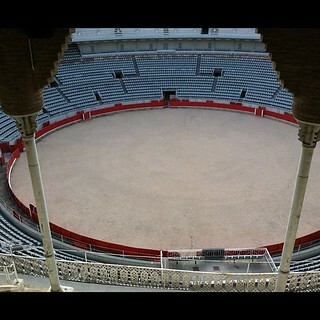 Barcelona’s bull ring is now the Museu Tauri. BARCELONA – Another late night in Spain. I’m using Fanta as my coffee. I think I broke the single-serving coffee machine in our apartment. I hear kids going wild at what must be their recess. 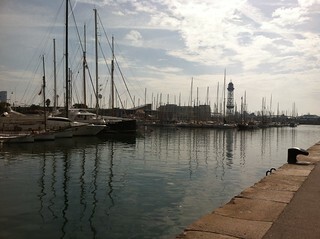 We made it to the Port of Barcelona yesterday. We mingled with tourists and locals by the bay. 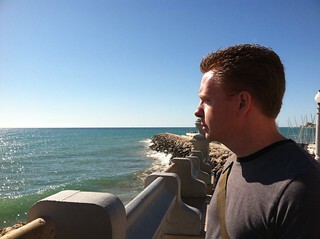 I loved being near the Mediterranean. In St. Petersburg, I had issues ordering vodka. At a cafe near my hotel, I told the server I wanted to sample their vodka. She looked horrified and said she didn’t understand English. I thought this was odd since we managed to go through my orders for an appetizer, dinner entree and a cocktail. “So sorry,” she said, refusing to offer any selections on what some people call Russia’s national drink. I gave up and asked for the bill.